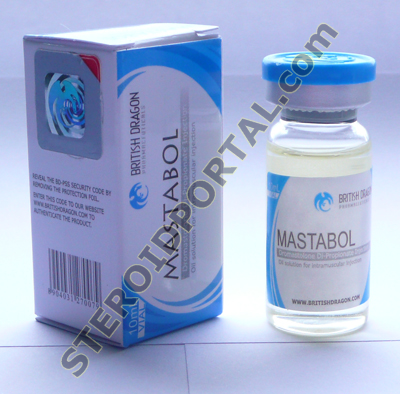 Description Mastabol 10 ml, 100 mg/ml, British Dragon / Drostanolone propionate: Mastabol (Drostanolone Propionate) is used to promote weight gain following extensive surgery, chronic infection, or severe trauma. Take Mastabol only as directed . Do not take more of it and do not take it more often than your doctor ordered. To do so may increase the chance of side effects. It will cause acne problems, but rarely increase blood pressure, and in most cases mildly decrease HTPA functuion. It isn't liver toxic, it does not aromatize, and since it is a DHT derivate it will not convert DHT. Highly androgenic / moderately anabolic / moderately anti-estogenic. Mastabol is a steroid highly valued by competing bodybuilders. The great popularity of this injectable steroid in bodybuilder circles is due to the extraordinary characteristics of its included substance. Drostanolone propionate is a synthetic derivative of dihydrotestosterone. This causes the Mastabol not to aromatize in any dosage and thus, it cannot be converted into estrogens. This distinctive feature is confirmed by the Belgian manufacturer, Sarva Syntex (no more in production), who on the enclosed package insert calls Mastabol a steroid with strong, antiestrogenic characteristics. British Dragon have production in 10ml bottle 100mg/ml. Since Mastabol is a predominantly androgenic steroid, the athlete can increase his androgen level without also risking an increase in his estrogen level. This results in a dramatically improved hardness and sharpness of the muscles. One must, however, make a distinction here since Mastabol does not automatically improve the quality of muscles in everyone. A prerequisite is that the athlete's fat content must already be very low. In this case Mastabol can then be the decisive factor between a smooth, flat muscle or a hard and ripped look. For this purpose Mastabol is often only used during the last four weeks before a competition so that the muscles get the last "kick." 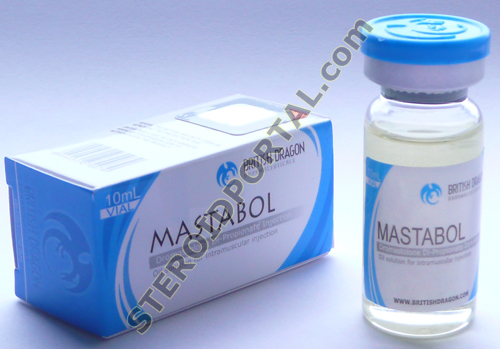 Mastabol is especially effective in combination with steroids such as Winstrol, Parabolan, Primobolan, Oxandrolone and also Testosterone propionate. The usual dosage taken by athletes is around 100 mg three times per week. Since the substance drostanolone propionate is quickly broken down in the body, frequent and regular injections are necessary. This fact makes Mastabol a very interesting steroid when doping tests must be passed by a negative urine analysis. Since the propionate substance of drostanolone does not remain in the body very long in a sufficient, detectable amount, athletes inject the compound with great success up to two weeks before a test. However, since it also has anabolic characteristics and thus helps the build up of a high-qualitative muscle system, the use of Mastabol is not only limited to the preparation stage for a competition. Athletes who want to avoid water retention and who readily have a problem with an elevated estrogen level, likewise appreciate Mastabol. Also in this case usually one ampule (100 mg) is injected every second day. In combination with Primobolan, Winstrol or Testosterone propionate no enormous strength and weight gains can be obtained, only high-quality and long-lasting results. Although women do not use Mastabol very often some national and international competing female athletes do take it before a championship. The dosages observed are normally 100 mg every 4-5 days. Mastabol is not hepatoxic so liver damage is quite unlikely. High blood pressure and gynecomastia are not a problem since neither water nor salt retention occurs and the estrogen level remains low. The main problem are acne and a possible accelerated hair loss since dihydrotestosterone is highly affinitive to the skin's androgen receptors, in particular, to those on the scalp. Since Mastabol. in most cases, is not administered in excessively high dosages and the intake, at the same time, is limited to a few weeks, the compatibility for the athlete is usually very good. Mastabol - Drostanolone propionate 100 mg/ml is a steroid highly valued as a part of a pre contest bodybuilders stack. This product doesn't aromatize - it can't be converted to estrogen. Drostanolonum is highly androgenic and a strong anti estrogen with minimal liver toxicity, it is usually used as a part of cutting stacks for the last few weeks of contest preparation, it works best in stack with Primobolan, Anavar, Winstrol and Testosterone propinate (Testovis). Mastabol is a favorite of athletes with preexisting gymecomastia and those who want to avoid water retention. Drostanolonum has a short half life therefore frequent administrations are required, this also makes water Mastabol suitable for tested athletes - as long as they discontinue Mastabol 2 weeks prior to urine analysis they should have no problem passing. To begin with, Mastabol (drostanolone propionate) is a derivative of DHT (dihydrotestosterone), and therefore, it will not aromatize into estrogen. Competing bodybuilders find this extremely beneficial because aromatization typically causes excess water retention which may give the muscles a smooth appearance. Another advantage of Mastabol is its strong androgenic component. The androgenic effect can cause a noticeable improvement in muscle density and hardness which can help the bodybuilder obtain the "ripped" look if his body fat percentage is low enough. The androgenic effect of Mastabol is also crucial because it helps to provide sufficent "kick" or "drive" for intense training when an athlete has lowered his caloric intake for contest preparation. It can also be used successfully by bodybuilders preparing for a drug-tested show. The substance is is fast acting and quickly broken down. The athlete can therefore use this drug up to about ten days before a drug test. The average dosage is 100 mg injected every other day. It is best to inject it every 2-3 days because it has a short duration of effect. Popular steroids stacked with Mastabol (drostanolone propionate) include Parabolan (trenbolone hexahydrobencylcarbonate), Winstrol (stanozolol), and Anavar (oxandrolone). Athletes rarely experience any side effects. It is not hepatoxic, and gynecomastia should not be a concern since it does not convert into estrogen. Some possible side effects of Mastabol include acne, accelerated hair loss, and increased aggression. The main disadvantage is a very poor availability on the black market and its high price. Belgium version comes in a box of two ampoules. Each 2 ml amp will contain 100 mg of drostanolone propionate. Mastabol is a steroid highly valued by competing bodybuilders. The great popularity of this injectable steroid in bodybuilder circles is due to the extraordinary characteristics of its included substance. Drostanolone propionate is a synthetic derivative of dihydrotestosterone. This causes the Mastabol not to aromatize in any dosage and thus, it cannot be converted into estrogens. This distinctive feature is confirmed by the Belgian manufacturer, Sarva Syntex, who on the enclosed package insert calls Mastabol a steroid with strong, antiestrogenic characteristics. Since Mastabol is a predominantly androgenic steroid, the athlete can increase his androgen level without also risking an increase in his estrogen level. Mastabol, or drostanolone propionate, is a popular steroid among competitive bodybuilders. It is commonly used in contest preparation for many reasons. To begin with, drostanolone propionate is a derivative of DHT (dihydrotestosterone), and therefore, it will not aromatize into estrogen. Competing bodybuilders find this extremely beneficial because aromatization typically causes excess water retention which may give the muscles a smooth appearance. Another advantage of Mastabol is its strong androgenic component. The androgenic effect of this steroid can cause a noticeable improvement in muscle density and hardness which can help the bodybuilder obtain the "ripped" look if his bodyfat percentage is low enough. The androgenic effect is also crucial because it helps to provide sufficent "kick" or "drive" for intense training when an athlete has lowered his caloric intake for contest preparation. Mastabol can also be used successfully by bodybuilders preparing for a drug-tested show. The substance drostanolone propionate is fast acting and quickly broken down. The athlete can therefore use Mastabol up to about ten days before a drug test. The average dosage of Mastabol is 100 mg injected every other day. It is best to inject Mastabol every 2-3 days because it has a short duration of effect. Popular steroids stacked with Mastabol include Parabolan (trenbolone hexahydrobencylcarbonate), Winstrol (stanozolol), and oxandrolone. Athletes rarely experience any side effects with this steroid. Mastabol is not hepatoxic, and gynecomastia should not be a concern since it does not convert into estrogen. Some possible side effects include acne, accelerated hair loss, and increased aggression. The main disadvantage of Mastabol is its very poor availability on the black market and its high price. Mastabol from Belgium comes in a box of two ampoules. Each 2 ml amp will contain 100 mg of drostanolone propionate. One of these boxes containing two amps can cost well over $50 on the black market.